I am, most definitely, one of THOSE PEOPLE. You know, the ones that smooths out, fold up, and saves the tissue paper at a gift giving occasion. AND, if it’s not my occasion, and I can’t tackle the people to save the paper, I die a little inside if it’s tossed. 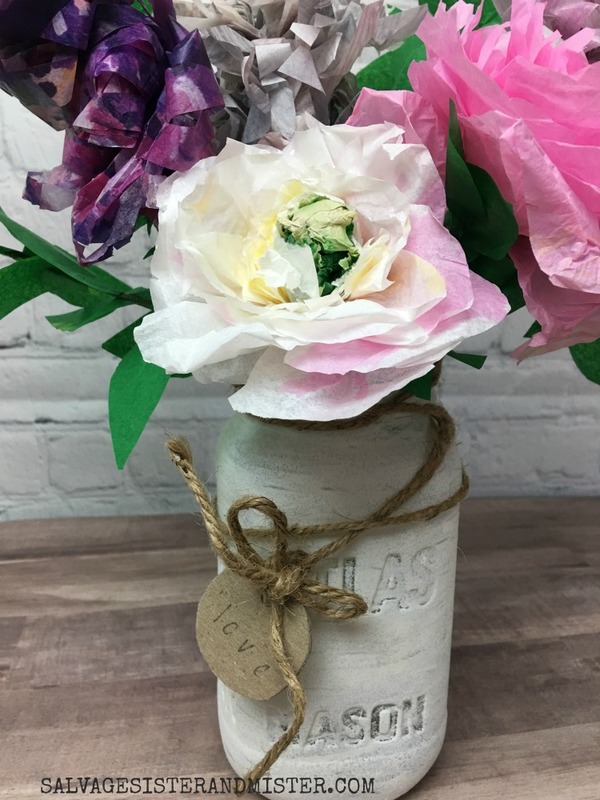 Not only do I reuse it for it’s intended use, but so much more like this tissue paper flower bouquet…. 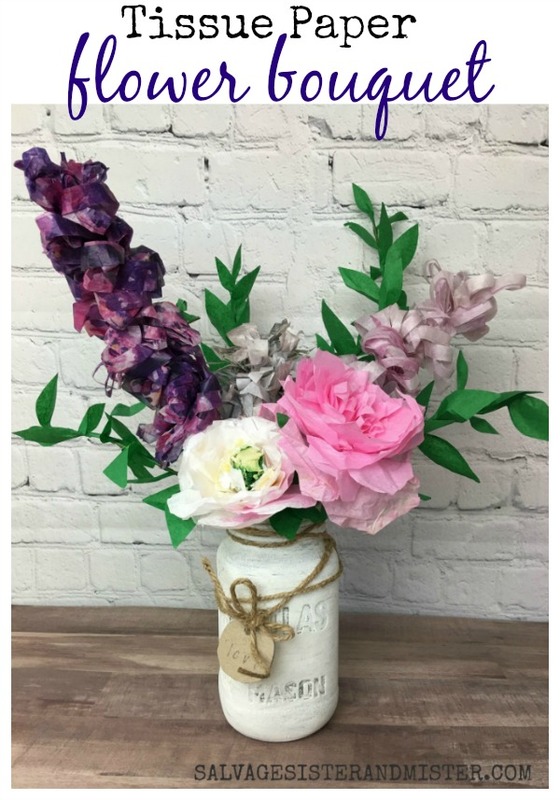 Wouldn’t these be great to give to nursing home residents, someone who doesn’t have spring flowers in their yard, a birthday, mother’s day, a friend in need? *We do use affiliate links, at no additional cost to you, to show the exact, or similar, items used. You can read our full disclosure policy here. Tip – In several flowers, printed floral tissue paper was used. This was done to provide some different coloring on the flower itself. 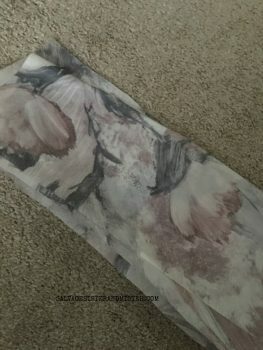 If you don’t have printed tissue paper, you can add paint, food coloring, bleach (as discussed below), etc to give some depth to your flowers…be as creative as you like. I found the tissue paper that was crinkled, and in otherwise not the best of condition, looked best. The first thing was to research the type of bouquet design. Looking on Pinterest or Google Images, you can find the design you are wanting or think of your own. Once the design is in place, you will know what flowers, and supplies, you will need for your bouquet. Bleach can be used to lighten tips of flowers. You can dip the tip of the flower in bleach but beware the tissue paper will sock up the bleach so use cautiously. Also, you can use a q-tip to lighten certain areas. You may want to use a scrap piece of test tissue paper before actually doing your flower. For the leaf branches, we used floral stems and cut leaves from the green tissue paper. That was then hot glued to the floral stem. If you want some really fancy ones, here is this tutorial for painted tissue paper leaves. 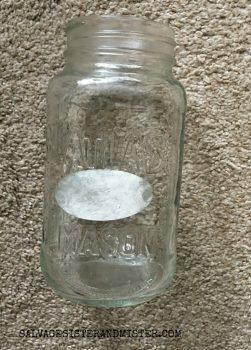 VASE – Taking a clean mason jar, paint the outside with chalk paint. Once the jar is dry, take twine and wrap it around the vase. The tag was made by cutting out a circle from scrap cardboard. One hole punch was done to the top. This one is stamped with love on it. We also did this for this project HERE. Since the mason jar was a jam jar, the tissue paper leftover from events, and the cardboard from our recycle this project was about as free as you can get. It just took some time, but it will last so much longer than a traditional bouquet. 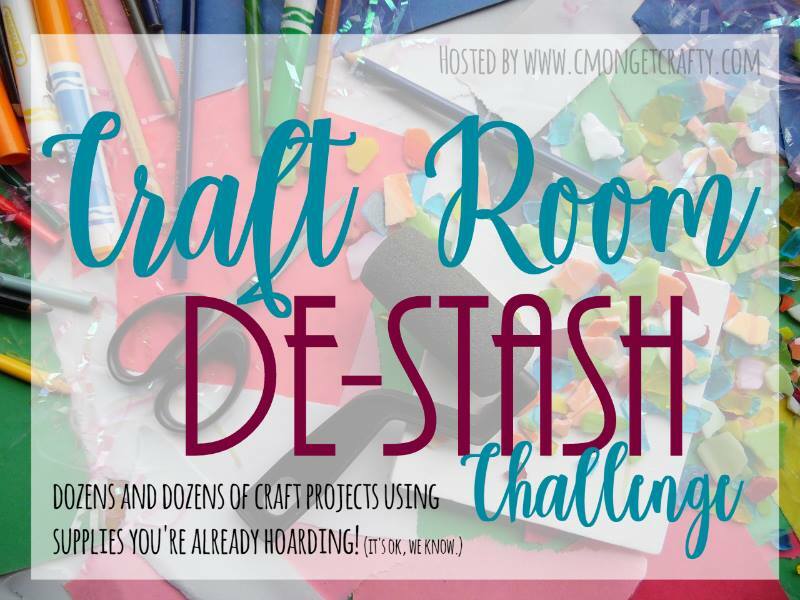 Oh, you are a crafter after my own heart. 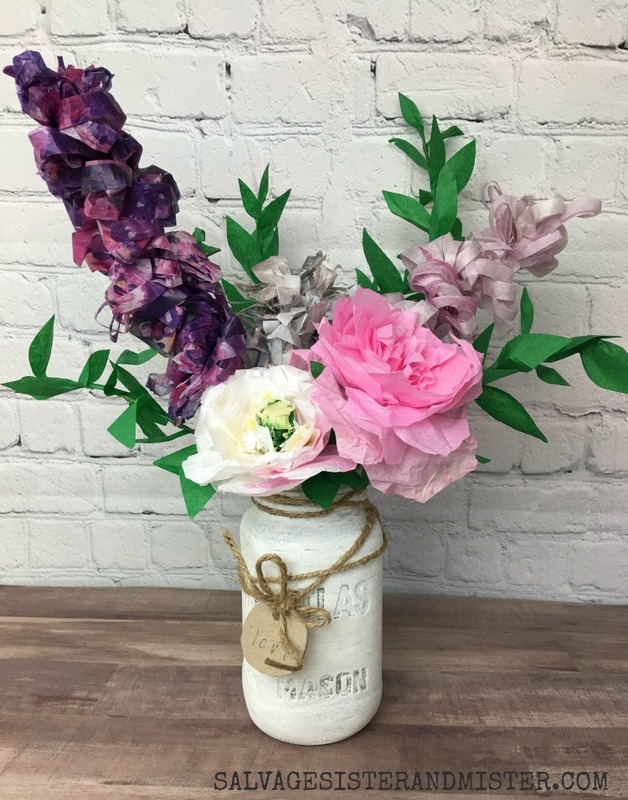 Not only do I adore the tissue paper flowers but since I have become obsessed with redoing old jam and spaghetti sauce jars this is the project for me. The flowers are so very pretty. This project is going on my must-try list. Thanks for sharing. Deborah, I totally LOVE your flowers! I used to be embarrassed by my mom who rescued every stray piece of tissue paper to reuse for packages. I vowed I would never do it, but now you are of the same mindset. She was doing it for packages. I like your use better. I haven’t experimented with paper flowers yet, but it’s on my list. Yours are so pretty! Florence, Oh, I would have loved your momma 🙂 My oldest thinks Im crazy at times but now that he is on his own I think he is saying my crazy ways..lol. I hope you’ll give these a try. Somehow my tissue paper flowers never quite look like this! Very impressive! Pinning! Isn’t is amazing what you can do with paper! Your bouquet is stunning!! Thank you Sam. I loved how they turned out. Your tissue flowers are so pretty and you provided such a great tutorial. I am a hoarder of tissue paper new and used alike. This bouquet is stunning. Great job. I thought I already commented on this, but I really love these flowers! They look so realistic! You’ve inspired me to get more creative with tissue paper myself. Thank you Florence. If you make something feel free to go to our FB page and share it with us. 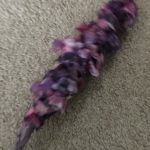 I love all flower crafts, but this one especially as it also is a Recycling Project! Thank you for providing all those tutorials to the various flowers. Can’t wait to make a Bouquet for myself. I absolutely LOVE this! I now feel the need to make a dozen of these now! 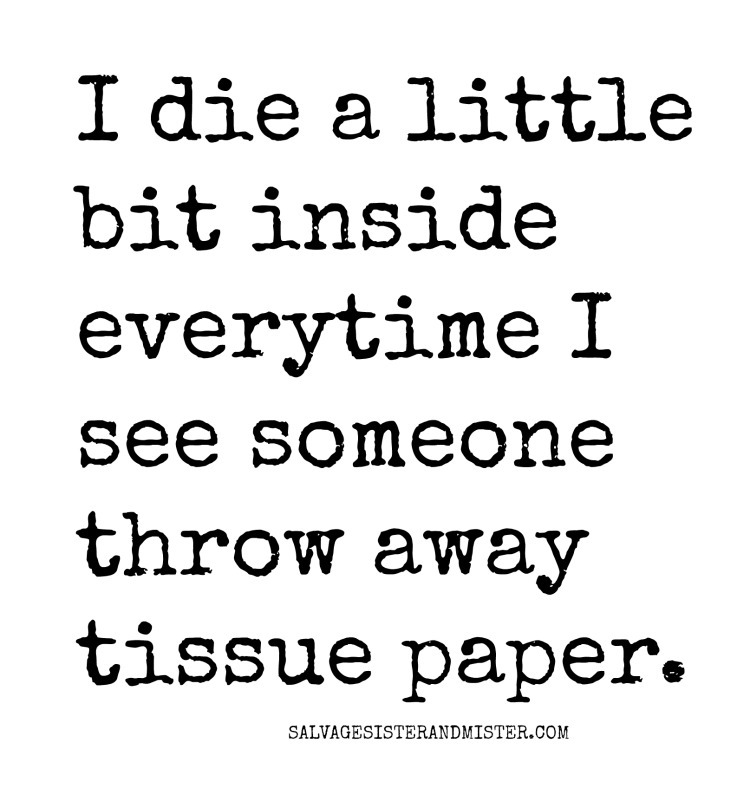 Lucky for me, I’m a total tissue paper saver as well! Your tissue paper flowers look absolutely amazing! Perfect for low maintenance decorations for a home resident or busy people. And so less tacky than plastic flowers trying to pretend to be real. I love this. Thank you! I was pleased with how they turned out.